…The reason for investing in the first place, right? 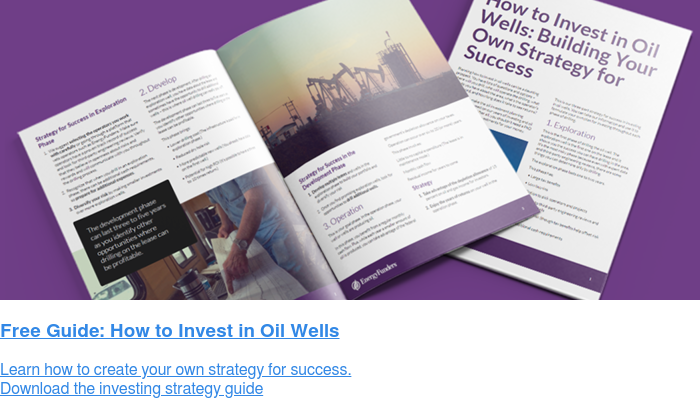 The first step to understanding how to calculate ROI (return on investment) is to decide what kind of oil investing fits your criteria. Are you looking for high risk/high reward exploration drilling projects or production buys with smaller but more defined returns? Understanding your risk tolerance, portfolio exposure, and what kind of returns you are looking for will help you select projects that fit your goals. The most obvious benefits of oil investing stem from the large tax benefits Uncle Sam gives us when we invest in oil and gas. You can deduct more than 80% of your drilling investments within the first year. This gives you a nice instant return on investment, and the tax benefits don’t stop after the first year. You can take a depletion allowance of 15% each year to account for decreasing oil and gas production. The return on investment (ROI) is another term for multiple on invested capital (MOIC) or return multiple. The ROI measures the gain or loss generated on an investment relative to the amount of money invested. You calculate ROI by dividing your total returned net revenue by the total net invested capital. The rate of return (ROR) or internal rate of return (IRR) is a metric used to estimate the profitability of a project. The internal rate of return is the interest rate (or discount rate) at which the net present value of all the cash flows (both positive and negative) from a project or investment equal zero. The term “internal” refers to the fact that the internal rate excludes external factors, such as inflation, the cost of capital or various financial risks. Another thing to consider is the source of the production estimates. Even great geologists tend to lean on the optimistic side. Make sure you get another set of eyes on the project. Third-party engineering economic reviews can help you make a decision and confirm the results of the source data or push you out of the project all together. The payback period (sometimes called “payback” or “breakeven period”) is the length of time required to recover the initial costs of an investment. The payback period ignores the time value of money (TVM), unlike other methods of capital budgeting such as net present value (NPV), internal rate of return (IRR) and discounted cash flow. The net present value (NPV) is also called present value or discounted cash flows. It’s the calculation you can use to find today’s value of a future stream of payments. Net present value is the difference between the present value of cash inflows and the present value of cash outflows over a period of time. Money in the present is worth more than the same amount in the future because of inflation and earnings from alternative investments that could be made during the intervening time. Look at how long the lease will yield production revenues. They differ by productive formation, geographic basin and whether you are producing oil and/or gas. Also look at whether there other developmental opportunities if the first well is successful. If so, how many more wells can operators drill? How much more capital are you prepared to put into the lease if the operator decides to drill more wells? What if a project pays back quickly but the total return is small? Is it worth the risk? What if a crude oil or natural gas investing project has a huge return potential but requires 10 years to fully realize. Is it worth it to you? As you learn how to calculate ROI, be sure to add in tax benefits, rate of return, net present value and investment life to get the full picture of how oil and gas investments can benefit you. At EnergyFunders, we believe in giving you all the data about an investment that we review before placing it on our platform. That way you can create a strategy for crude oil and natural gas investing that takes into account your goals and risk tolerance. Sign up to view our vetted investments with top operators.